It’s the beginning of May and you check your Facebook. You end up seeing people working on costumes, putting up their cosplay plans, good food places, and a big feed of posts counting down to the big event. And soon you see yourself doing the same thing, working all around the clock to get everything done before the countdown goes to zero. The day comes when the event starts, you end up tired, but still hyped as it is beginning! That was pretty much everyone who was attending Fanimecon. Everyone was finishing up their cosplays before the con starts and it didn’t help much knowing that there’s that one dude that counts down all the days before the convention begins. But amidst all of the last minute works, me and all of the attendees are hyped as ever that the wait is over. 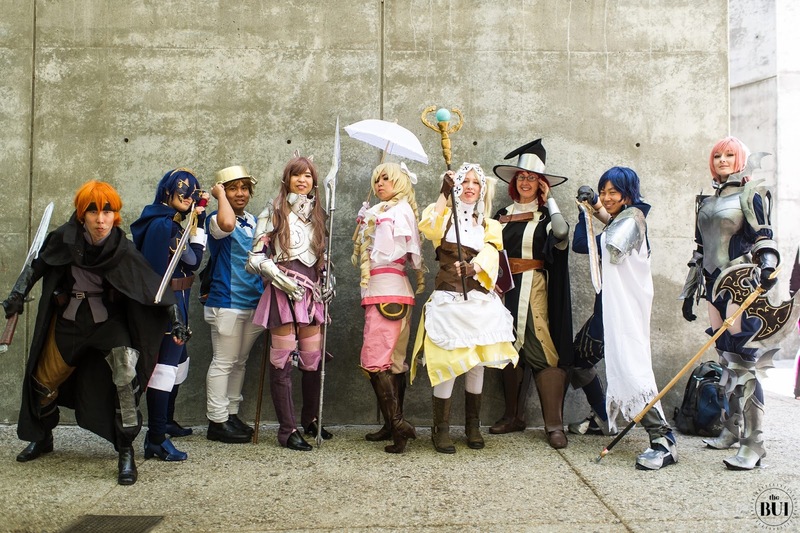 Fanimecon 2015 has begun and we can’t wait to see what they have this year! 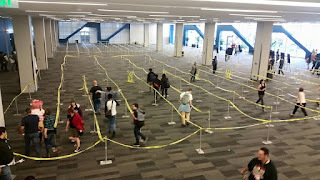 Thursday of Fanime week came in which meant it’s Day 0 and everyone can pick up their badges before the con begins the next day. I would wake up early finishing up all of my packing before meeting up with my friends for one last brunch close to home. Call it my last meal at home until Fanime ends. Afterwards, I would take a couple of my friends and would drive down to Downtown SJ from there where we would be headed to Fanimecon. What was difficult was that they had luggage of their own so fitting all of their stuff into my sedan was challenging. But with a little luggage tetris skills, we would be able to fit them all in. Now onwards to FanimeCon! 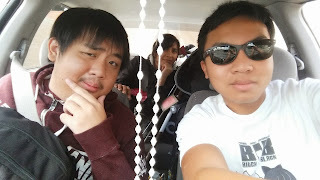 En Route to FanimeCon 2015! When we arrived at Downtown San Jose, we were passing through roads that had the Fanime banners up and I just felt a sense of excitement inside me. That these next 4 days, I’m feeling confident that I’m going to have a good time and that I just can’t wait to get out and take that walk to the convention full of attendees and just have an amazing time at Fanime. Now first, I would help my friends check into their hotel which was at the Hyatt Place, located directly across from the con. Once they got settled in, we would all head straight to registration where would see the line…..and their wasn’t any line!!! 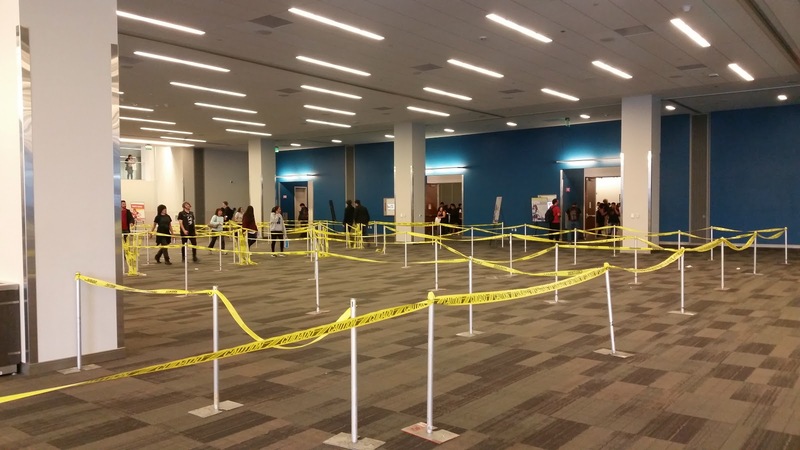 I would gladly say from this point on, the linecon that has plagued FanimeCon from 3 years ago has gone. Need not fear, everyone is safe (to get their badges without complaint). Now what’s there to do? Well for me I had to wait a little longer since Press/Industry registration happens later on in the day. But what about the other attendees? Nothing much actually until later for Swap Meet. The con was still calm as dealers were finishing up the final touches to their booths at Dealer’s Hall, artists are making their booths look nice for the attendees at Artist’s Alley, Stage Zero is still setting up, and the video rooms are still in preparation for the next day’s showing. So there was nothing to do until 6pm when the gaming room opened up. Still, attendees were able to grab their badges until 8pm, talk to their friends before the con begins, check into their hotel room, and just wander around the city of San Jose and grab a good meal for the night before checking in as the con begins. Which is what I pretty much did on day 0. Nothing really extravagant happened on this day. I just grabbed my press badge and then headed out for dinner with friends. 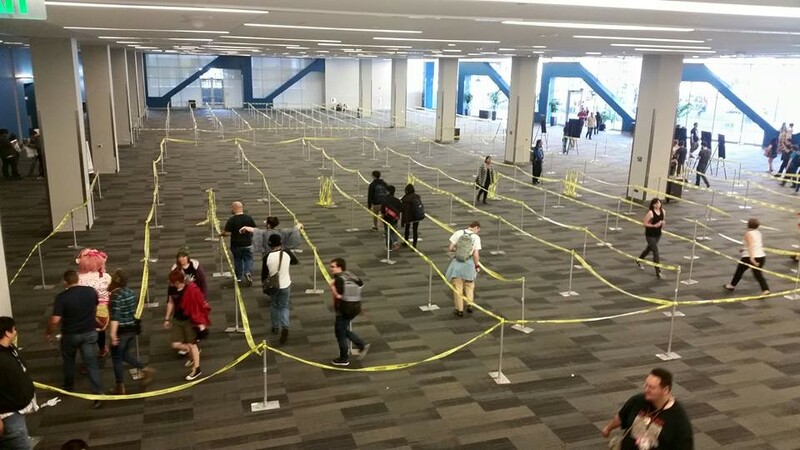 The line of Fanime registration. WHAT LINE???? View from the 2nd floor seeing the Fanime Registration Line. Need not worry, everyone is fine. We then headed over to Swap Meet which is now located at the big South Hall. Fanime hasn’t used this area since two years ago for Artist’s Alley during the reconstruction years of the McEnery Convention Center. Now they were able to use this place for a selling ground for attendees to sell their stuff to other attendees of Fanime. And the tent was big! If it was able to accommodate over 150 artists two years ago, then the hall should be able to give a lot of space to those selling at the Swap Meet. We would arrive around 2 hours until the doors close at midnight. And about half of the whole hall was filled since there weren’t much sellers selling on this first day of Swap Meet. Even with the low rate of sellers, I was able to grab a couple of things that seemed reasonable to buy. Some actually were a steal since they are cheaper than what you would find over at Dealer’s Hall. I ended up getting 5 packs of card sleeves and a poster which I find reasonable to buy. When Swap Meet closed, I would check out the gaming hall that opened up during the day and I would play a couple of games including DDR and Technika while waiting for a friend playing League of Legends. I would also catch up with other friends that I haven’t seen in quite a while, even those I haven’t seen since last Fanime! It was a good reunion moment for us and I hoped to see them around at this year’s Fanime. Now I didn’t have a hotel room for the con on this day, but a friend of mine was able to let me stay for the night in his house in San Jose. So I was able to take on the offer and just sleep at his place for the night before we checked into our hotel room the next day. But overall it has been a really busy first day. In fact, we didn’t sleep till 4am! It must be that hype for Fanime as it all begins tomorrow! 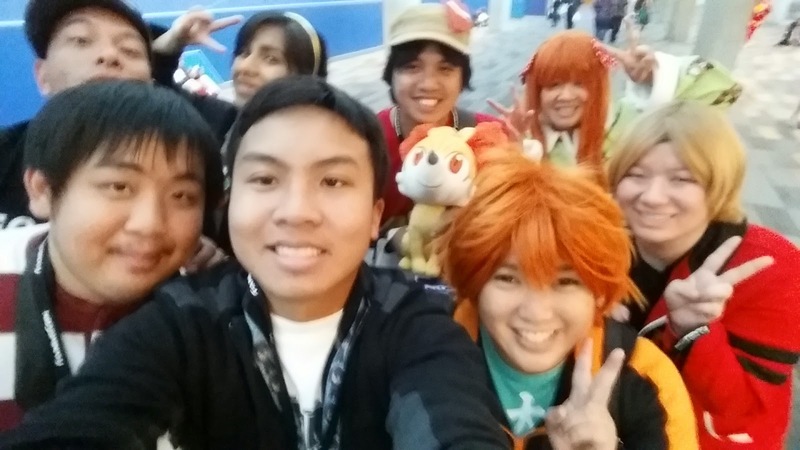 First Selfie of Fanimecon 2015! We would wake up at 9am to arrive at the Marriott hotel at around 10am to check in. We would drive to the hotel driveway to drop off our stuff for the con. And we had a lot considering we were 3 people staying at a 4 day convention. We would take some time taking down our stuff holding up the driveway, sorry to the Marriott staff about that problem. We didn’t want to take Valet Parking there so we decided to drive the car to a parking lot in the area. Since all the closeby lots were all full of Fanime attendees, we parked over at the SJSU 4th street parking garage which was around 5 blocks from the convention center. Best of all, it’s free parking for the weekend! Once parked, I would head back to the Marriott hotel where we would grab our hotel room keys and headed to our room to unpack and get into our cosplays for the day. On this day, I would dress up as a Genderbent Madoka Kaname from the anime series Puella Magi Madoka Magica. We had a full guys group with us but most of them decided to meet on day 3 of Fanime but a couple of the guys’ group and all of the female group decided to meet up on this day. The whole group would meet up and we would wander around the con for a while checking out Stage Zero and Dealer’s Hall as it opened up today at 2pm. But what surprised me about Dealer’s Hall was the huge massive line of people coming into the hall. The line was so huge that it stretched out all the way to where the midnight dance was. Looks like Linecon hasn’t left Fanime yet. Going Meguca today. Don't I look good in pink? Around 1:30pm, I would leave our Madoka Magica group and head back to the hotel room to change out to my Team Aqua grunt cosplay from Pokemon Alpha Sapphire. My roomate was going to be Magma Admiral Maxie so it was a little strange knowing that two rivals were dressing up in the same hotel room. I just wanted to doust him with water haha. We meet up around 2pm with our Team Aqua and Magma group for a little photoshoot. And when you see photos from the photoshoot, you’ll see a big dominance for the Magmas. Although the aquas have two of the three admirals at the shoot, I was the lone aqua grunt! Apparently Archie didn’t give out the memo to all the aqua grunts or the fact the other aqua grunts in the group had other plans to attend to. Still we had a good shoot and I had fun while doing. It only lasted about 1-2 hours before I headed back to my hotel room to dress back into GB Madoka Kaname for the Madoka Magica gathering at 4pm. 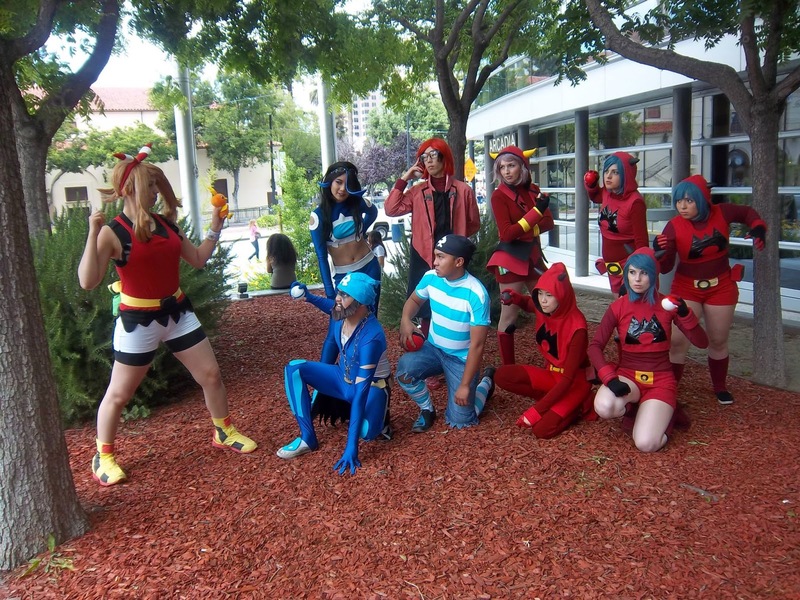 Both the females and most of the males of our group that we made would be at the gathering for a hangout with other cosplayers from the series. 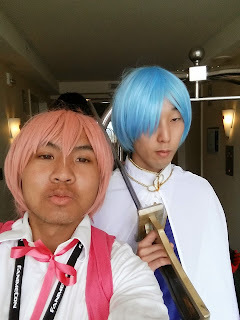 In fact I actually knew a lot of people that went to the gathering, including my co-blogger Tally who was cosplaying as Kyoko Sakura. The gathering was fun as we were able to get photos of our cosplays and get to know other cosplayers while participating in it. I would continue to wear my Madoka Kaname cosplay for a couple more hours before dressing out and grabbing dinner with friends. Johnny Rockets was the place we had for dinner, but I was aware of the new menu that they gave out to us which I will bring up during the review part of this post. Afterwards, we would grab milkshakes at the same block at MyMilkshake and then I would just hang out with friends in their hotel rooms before heading back to bed getting ready for the next day. Overall, I had a pretty busy day with the constant changing of cosplays. Tomorrow was planned to be even crazier so this was just the beginning of the craziness that is gonna happen on this Fanime Weekend. Someone was cosplaying Billy Mays at Fanime. That's freaking awesome! Afterwards, I would change to my Donnel cosplay from the video game series Fire Emblem Awakening. I would head down to my friends who were also cosplaying from the game to be talking along to other people that I haven’t met before. 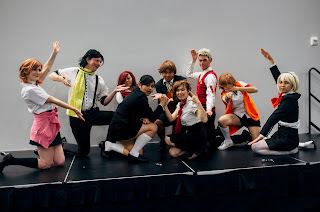 It turns out they were cosplayers from the big group that we were trying to make for Fanime this year. We had most of the characters there and I had a chance to talk to them saying how well they made their cosplays and talk about the game and the relationships that happen in the game. Apparently, they pair Donnel with characters I haven’t thought about shipping him with. But overall it was just a fun time with making new friends and getting photos of our group as well. Oh and we were mostly hanging out at what I would call “Photogs corner” where all the photographers would set up their stations there and grab photos of cosplayers that they would find wandering around the front of the con or around this corner. You wouldn’t believe how many people wanted our photos when wandering around this area of the con. It looked like all of the photogs would be there, that I would like to grab a photog there if in case I want a shoot of a cosplay of mine. Me and the Fire Emblem would wander away from that corner to head to the gaming room for some fun. We would take over one of the purikura booths in the room and take silly photos of our group. 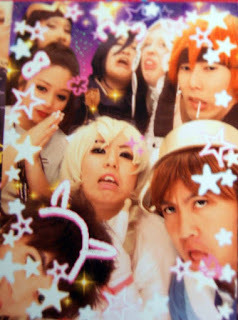 We posed in some strange ways and even decorated the photos to our amusement. We Fire Emblem cosplayers looking silly in the Pikakura booth! I would later change out of my cosplay into regular clothes since I had no cosplay plans to do until later on in the night for the Persona midnight gathering. So what’s there to do? Well there was Musicfest that I should have gone to, but to be honest I wasn’t as hyped to go as I thought I would be. The headlining band was Back-On, who has performed theme songs for many animes including Eyeshield 21 and more recently Fairy Tail and Gundam Build Fighters. The only show I watched from this was Fairly Tail and that song was hype. But I had other obligations to go to which included me and a pool party with friends I haven’t met in a while. And even a hangout with my friends in their hotel room. I would miss Musicfest for the first time since 2012. Sad to hear I know, but let’s see if the headlining band next year will be someone I would recognize a whole lot more. I would grab a little dinner out at Hogie’s Steak out before heading to the Persona Midnight gathering which was misleading this year. When I was changing out, I would receive a call from my friend wondering where I was. It was 11:30 when she called and I told her I was still dressing up. She told me the gathering was happening and when I heard that, I quickly dressed out and jetted my way to the gathering location at the Hub where the past Midnight gathering were held. This gathering wasn’t like 5 minutes long like last year’s. At least it was longer (actually 30 minutes) this time around. I would be able to meet up with everyone and would be in the last group shot of the gathering. Afterwards, I would be in a group and would be in a photoshoot with them for most of the night. We would take some serious photos as well as some silly ones. You guys will really like our JoJo posing one! Our group would do that for a while before checking back into our hotel room for bed as we get ready for the next day. But as you can see, it was another crazy day of cosplaying for most of the day. I do love the fact I was able to meet up with my old friends I haven’t met in a while as well as making new ones and hopefully cosplaying with them again soon. That so far has been a highlight for me at this con. I hope to see more of this in the next day. Part 2 of my Fanime report will be coming up in a couple of days. Stay tuned!